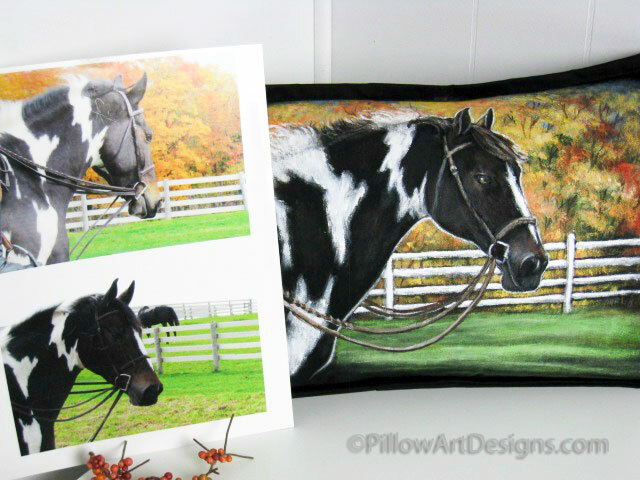 A very special gift for the horse owner or horse lover, our custom horse portraits are one of our favourite things to work on. You supply the photos and your ideas, and together we can create a beautiful and unique tribute to your best equine friend. Carol uses the images you provide to us and incorporates background content and colours according to your preference. The portrait can be painted on black twill fabric, winter white cotton poly, or eggshell linen. If you have a preference for another colour we will do our best to source for you, or perhaps you may choose to provide the fabric you'd like us to use. If you are interested in having a portrait done, contact us here with your ideas, we'd love to work with you to create something unique and special! All Feather Sisters fine art pillows are unique. 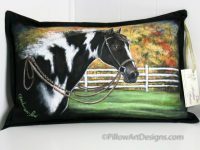 They are originals hand painted and signed by Canadian artist Carol Henderson-Pew. We ask for two weeks to complete your order, however, depending on work load, we may be able to complete it in less time.